This lightly pickled salad was left over from yesterday’s lunch. It was delicately sweet and slightly bitter the first day, and even more intense on the second. Pressing the vegetables makes them more digestible and the nutrients more accessible. 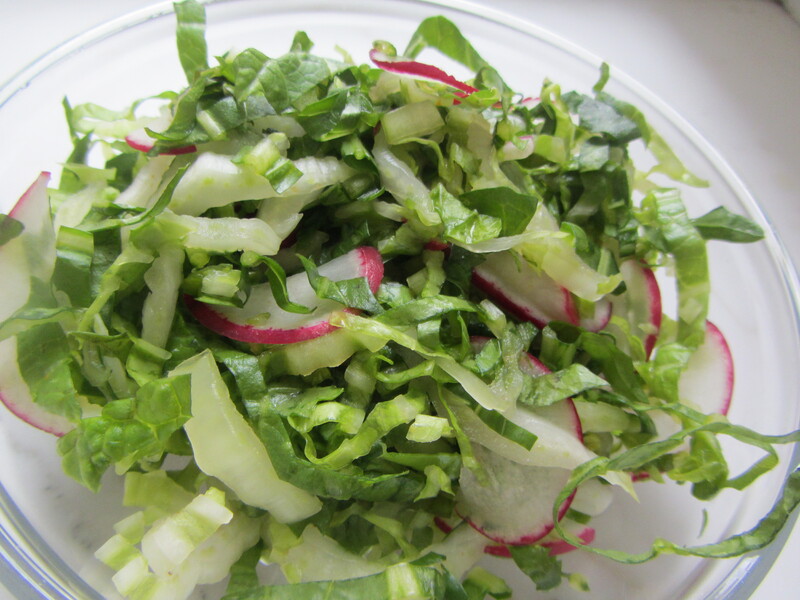 Process Wash the Napa cabbage, dandelion and radishes separately and carefully. Lay the cabbage leaves on a wooden cutting board; slice each one into thin horizontal strips, about 1/8 inch wide. Set aside. Cut the dandelion leaves into similarly sized strips. Slice the radishes into paper-thin rounds; halve each round. Place all three vegetables into a large glass or ceramic bowl. Disperse the sea salt in the salad. Use your fingers to gently mix all three vegetables together and massage the salt into them. This should take a good 3-5 minutes. Pull together the greens and form them into a mound. Cover them with a glass or ceramic plate. Place a weight on top of the plate. I use a gallon jug filled with water. Leave the salad with the weight on top for 2 hours. Remove the weight and use the plate to drain the water out of the salad. Place the salad into a clean bowl. Use your fingers to mix it well.Squeeze the mandarin orange and pour the juice on top of the salad. Serve. Vegetables for Breakfast is a blog, soon-to-be-book and a way of transforming the way you eat. Eating veggies for breakfast can change your relationship with food by changing the way you absorb, digest and metabolize meals. For one year, from June 19, 2013 until June 19, 2014, I posted the vegetable dish I served for breakfast, almost daily. Since June 19, 2014, I have been posting monthly and usually posting the whole breakfast: the vegetable dish accompanied by a grain and (often) a plant protein. Just a quick note to say K is really enjoying your class. He was excited to make the sushi and the falafel the previous week was awesome- we have been trying (unsuccessfully) for years to get him to eat falafel and so hearing him say he likes falafel now was a breakthrough for us! Thanks!